The ReDot gallery is proud to welcome the 1st Singaporean show for the exciting works of the Yulparija and Mangala artists of Bidyadanga. 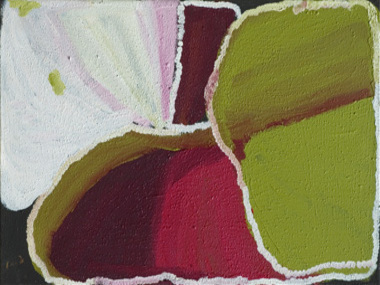 “FROM DESERT TO SALTWATER COUNTRY” will showcase the very best from this art community whose ancestral lands lay in the Great Sandy Desert but who paint in a beautiful colonial bungalow in Broome. Dating back to the 1960’s, a group of Yulparija women and men left their traditional country around Well 33 on the Canning Stock Route in search of water as a severe drought had left their Great Sandy Desert country desolate and people where dying. There was little option but to walk out and they headed to Le Grange Mission, now known as Bidyadanga, two hours south of Broome in the traditional saltwater country of the Karrajarri people. The story of their current art making is much more recent however, dating back to mid-1999 when a thin, delicate young man, only 16 at the time, walked in to the little Short Street Gallery in Broome's Chinatown, and approached its owner, proclaiming "I am an artist, and there are old people in my community who need to paint." The young man in question, Daniel Walbidi, could not have anticipated the appetite and applause the works of this small group of painters would receive and the impact his actions would have on all of their lives. The extraordinary works of the Yulparija artists reflect the contemporary experiences of these people, with desert iconography being portrayed in the rich blues and reds and greens of the coastal landscape that the artists have been living in for the past 35 years. 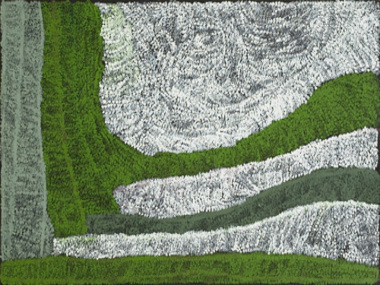 Established artists Donald Moko, Jan Billycan, Lydia Balbal and Weaver Jack will be exhibited along with works of more emerging talents such as Margaret Baragurra, Mary Meribida and Susie Gilbert. There will also be work by Daniel Walbidi himself! "Without him," says Emily Rohr, Director of Short Street Gallery, Bidyadanga art would never have happened. 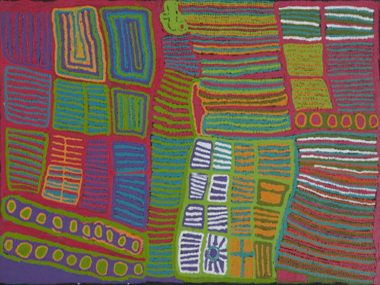 The community have exhibited regularly around Australia and overseas, and have been widely collected by important institutions and collectors, including National Gallery of Victoria, Laverty Collection, RACV Collection, Myer Collection, Kerry Stokes Collection, University of Notre Dame, National Gallery of Australia, the Art Gallery of Western Australia and many others.